Tolathomas (Omotola Racheal Olabode Thomas Alakunle) is a gospel songwriter and minister. She has shown interest in and has been writing songs right from her secondary school days. Tolthomas was once a member of the parish youth choir, of the Anglican Church of Pentecost (COP) in Festac Town, Lagos. At COP, she developed her unique style of ministering, which appeals to the soul and inspires one to thirst more for God’s presence. Her first produced single is a soul lifting piece, titled Mercy (Siju anu wo mi). 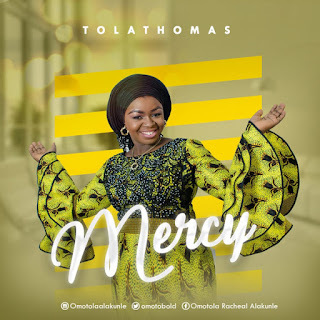 Tolathomas has a compassionate heart which motivates her and manifests in her deep love for songs and singing. She loves God, she also loves musical movies. Tolathomas, hails from Ogbagi Akoko in Ondo state, is a marketing graduate of Babcock University and a professional in the Customer experience. She serves as a member of the choir of RCCG; Jesus Mega Sanctuary, a young adult and youth Church, she is married to Mr. Olabode Thomas Alakunle and she blessed with lovely children. Mercy is a song that was inspired due to some challenges. All I could do at that time was talking to God about the challenge and in the process, the song. It's not my first song, but as God would have it, it’s the first to come out as a single. It’s a song that can be used to start the day because its all about prayer, seeking the face of God to have Mercy.